I love America and I believe in America First. I am also unapologetically white. Therefore, by definition, I am a “white nationalist,” which is a term I hadn’t heard until the buildup to the Charlottesville tragedy. The term “white nationalist” grew from near obscurity to a household word nearly overnight during the days before Charlottesville. It was hyped by the media, mentioned by every liberal weenie talking head and Democrat politician who could waddle to the nearest microphone. However, “white nationalist” is not a temporary name for those of us who love America. No, no, no! It is who we are now, according to the Democrat Party and its official communications bureau, the mainstream media. It is who President Trump is now, as well as his staff. 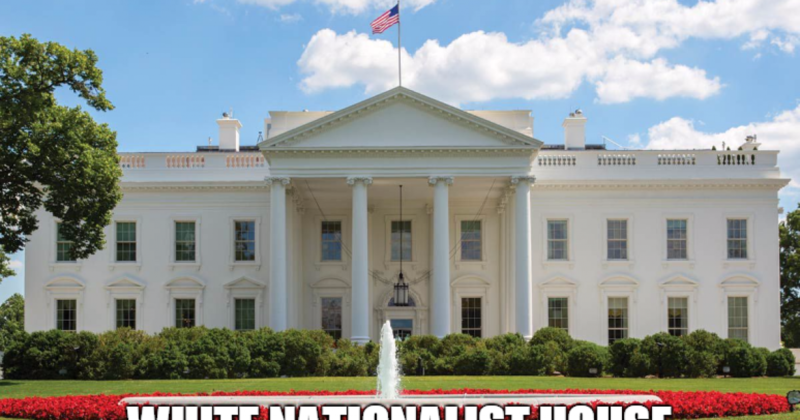 “White nationalism is a type of nationalism or pan-nationalism which holds the belief that white people are a race and seeks to develop and maintain a white national identity. Its proponents identify with and are attached to the concept of a white nation. White nationalists say they seek to ensure the survival of the white race, and the cultures of historically white states. They hold that white people should maintain their majority in majority-white countries, maintain their political and economic dominance, and that their cultures should be foremost. Many white nationalists believe that miscegenation, multiculturalism, immigration of nonwhites and low birth rates among whites are threatening the white race, and some argue that it amounts to white genocide. White separatism and white supremacy are subgroups of white nationalism. Separatists seek a white-only state; supremacists believe that white people are superior to nonwhites, taking ideas from social Darwinism and Nazism. Both subgroups generally avoid the term supremacy because it has negative connotations. By the way, you need not be white to be a “white nationalist.” You can be black or Asian or Hispanic or native American or Eskimo. According to liberal weenies, all you have to do to qualify is to love America. How easy is that? So, how does it feel to be a “white nationalist,” fellow patriots? The Democratic Congressional Campaign Committee labeled two former White House aides and one current aide as “white nationalists” in a tweet Saturday. There is no evidence that former White House chief strategist Steve Bannon, former national security aide Seb Gorka, or current senior policy adviser Stephen Miller want to establish a nation solely for white people, but the Democrats went ahead with the charge. “Two white nationalists down. One to go. We can do this,” the DCCC tweeted along with a photo of the aides. The connections of these White House aides to white nationalism is loose. Bannon continues to be tied to white nationlism due to him saying his news outlet Breitbart served as a “platform” for the alt right. (The term alt right is nebulous and doesn’t necessarily mean white nationalism.) In addition, the former senior White House aide labeled white nationalists a “collection of clowns” in a recent interview. Meanwhile, Gorka, who departed the White House under unclear terms, has been attacked due to allegations that he belonged to a far right Hungarian party with ties to the Nazi Party. However, he has denied these charges and people who knew Gorka from his days in Hungary say it isn’t fair to characterize him as sympathetic to Nazis. Most of the criticism of Miller stems from his goal of reducing immigration. This, however, doesn’t make one a white nationalist. In addition, prominent white nationalist Richard Spencer claimed to be a mentor of Miller during their time together at Duke University.